The above video is a bass guitar lesson of the African famo genre. 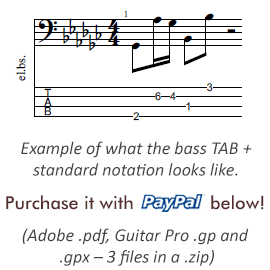 If you are curious about it, I suggest you to download the tablature (click the button down at the end of this article), and you’ll be able to study this bass line with ease. We already had a fingerstyle guitar video + explanation on this Lesothan music style. Don’t forget to check that one out, so you get to know more on famo as a genre as well. Our current tune has a shuffle rhythm; it means that the groove has a triplet feel, as indicated in the tab. Even though the song is written in D major key, it’s a modal piece, in dorian mode. That being said, the chord structure can be noted as going from ii to I repeatedly, then finally resolving on the ii in the end. The beginning part of the bass line is a calm groove played at the lower end of the fretboard. While it’s relatively easy to finger, you still have the important task to express enough musicality with it. What do I mean by this? Well, the thing is, you have to play it with a sort of laid back elegance. You are definitely not supposed to treat it as a blues shuffle. To help bringing all these feelings out, I used the warmer tone setting for the P-pickup in my Ibanez bass, flicking the switch to where the two halves are wired in series, for a lower resonance peak. I suggest you to use a similarly thicker and warmer tone. The notes in the second section have lots of little embellishments. These are important. Even though you could theoretically play the bass line without these, it really wouldn’t be the same anymore. The hammer-ons in the triplets at the start of the phrase define this part of the song. While they’re not exactly challenging as far as difficulty goes, to get them right and in time requires some practice. You’ll notice that there’s some syncopation going on in this part, where the rhythmic accents are placed across the bar lines. The heart of this entire genre is the subtlety in the placement of the notes, rhythm-wise. Nothing is quite on an imaginary grid, at least not the kind of grid you might be used to, unless you are a sotho geek or a resident.